This article is about the literary device. For the prewriting technique, see Free writing. In literary criticism, stream of consciousness is a narrative mode or method that attempts "to depict the multitudinous thoughts and feelings which pass through the mind" of a narrator. The term was coined by William James in 1890 in his The Principles of Psychology, and in 1918 the novelist May Sinclair (1863–1946) first applied the term stream of consciousness, in a literary context, when discussing Dorothy Richardson's (1873–1957) novels. Pointed Roofs (1915), the first work in Richardson's series of 13 semi-autobiographical novels titled Pilgrimage, is the first complete stream of consciousness novel published in English. However, in 1934, Richardson comments that "Proust, James Joyce, Virginia Woolf & D.R. ... were all using 'the new method', though very differently, simultaneously". There were, however, many earlier precursors and the technique is still used by contemporary writers. 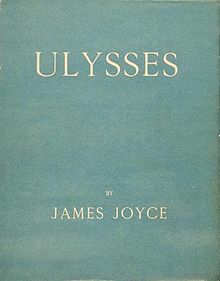 Cover of James Joyce's Ulysses (first edition, 1922), considered a prime example of stream of consciousness writing styles. While the use of the narrative technique of stream of consciousness is usually associated with modernist novelists in the first part of the twentieth-century, a number of precursors have been suggested, including Laurence Sterne's psychological novel Tristram Shandy (1757). It has been suggested that Edgar Allan Poe's short story "The Tell-Tale Heart" (1843) foreshadows this literary technique in the nineteenth-century. Poe's story is a first person narrative, told by an unnamed narrator who endeavors to convince the reader of his sanity, while describing a murder he committed, and it is often read as a dramatic monologue. George R. Clay notes that Leo Tolstoy "when the occasion requires it ... applies Modernist stream of consciousness technique" in both War and Peace (1869) and Anna Karenina (1878). The short story "An Occurrence at Owl Creek Bridge" (1890) by another American author, Ambrose Bierce, also abandons strict linear time to record the internal consciousness of the protagonist. Because of his renunciation of chronology in favor of free association, Édouard Dujardin's Les Lauriers sont coupés (1887) is also an important precursor. Indeed, James Joyce "picked up a copy of Dujardin's novel ... in Paris in 1903" and "acknowledged a certain borrowing from it". There are also those who point to Anton Chekhov's short stories and plays (1881-1904) and Knut Hamsun's Hunger (1890), and Mysteries (1892) as offering glimpses of the use of stream of consciousness as a narrative technique at the end of the nineteenth-century. While Hunger is widely seen as a classic of world literature and a groundbreaking modernist novel, Mysteries is also considered a pioneer work. It has been claimed that Hamsun was way ahead of his time with the use of stream of consciousness in two chapters in particular of this novel. British author Robert Ferguson said: “There’s a lot of dreamlike aspects of Mysteries. In that book ... it is ... two chapters, where he actually invents stream of consciousness writing, in the early 1890s. This was long before Dorothy Richardson, Virginia Woolf and James Joyce.”  Henry James has also been suggested as a significant precursor, in a work as early as Portrait of a Lady (1881). It has been suggested that he influenced later stream of consciousness writers, including Virginia Woolf, who not only read some of his novels but also wrote essays about them. However, it has also been argued that Arthur Schnitzler (1862-1931), in his short story '"Leutnant Gustl" ("None but the Brave", 1900), was in fact the first to make full use of the stream of consciousness technique. But it is only in the twentieth-century that this technique is fully developed by modernists. Marcel Proust is often presented as an early example of a writer using the stream of consciousness technique in his novel sequence À la recherche du temps perdu (1913–1927) (In Search of Lost Time), but Robert Humphrey comments, that Proust "is concerned only with the reminiscent aspect of consciousness" and, that he "was deliberately recapturing the past for the purpose of communicating; hence he did not write a stream-of consciousness novel". Novelist John Cowper Powys also argues that Proust did not use stream of consciousness: "while we are told what the hero thinks or what Swann thinks we are told this rather by the author than either by the 'I' of the story or by Charles Swann." The term was first applied in a literary context in The Egoist, April 1918, by May Sinclair, in relation to the early volumes of Dorothy Richardson's novel sequence Pilgrimage. Richardson, however, describes the term as an 'lamentably ill-chosen metaphor". James Joyce was a major pioneer in the use of stream of consciousness. Some hints of this technique, are already present in A Portrait of the Artist as a Young Man (1916), along with interior monologue, and references to a character's psychic reality rather than to his external surroundings. Joyce began writing A Portrait in 1907 and it was first serialised in the English literary magazine The Egoist in 1914 and 1915. Earlier in 1906 Joyce, when working on Dubliners, considered adding another story featuring a Jewish advertising canvasser called Leopold Bloom under the title Ulysses. Although he did not pursue the idea further at the time, he eventually commenced work on a novel using both the title and basic premise in 1914. The writing was completed in October 1921. Serial publication of Ulysses in the magazine The Little Review began in March 1918. Ulysses was finally published in 1922. While Ulysses represents a major example of the use of stream of consciousness Joyce also uses "authorial description" and Free Indirect Style to register Bloom's inner thoughts. Furthermore, the novel does not focus solely on interior experiences: "Bloom is constantly shown from all round; from inside as well as out; from a variety of points of view which range from the objective to the subjective". In his final work Finnegans Wake (1939) Joyce's method of stream of consciousness, literary allusions and free dream associations was pushed to the limit in, which abandoned all conventions of plot and character construction and is written in a peculiar and obscure English, based mainly on complex multi-level puns. Another early example is the use of interior monologue by T. S. Eliot in his poem "The Love Song of J. Alfred Prufrock" (1915), a dramatic monologue of an urban man, stricken with feelings of isolation and an incapability for decisive action," a work probably influenced by the narrative poetry of Robert Browning, including "Soliloquy of the Spanish Cloister". Prominent uses in the years that followed the publication of James Joyce's Ulysses, include Italo Svevo, La coscienza di Zeno (1923), Virginia Woolf, Mrs Dalloway (1925), To the Lighthouse (1927), and William Faulkner in The Sound and the Fury (1929). Though Randell Stevenson suggests, that "interior monologue, rather than stream of consciousness, is the appropriate term for the style in which [subjective experience] is recorded, both in The Waves and in Woolf's writing generally. Throughout Mrs Dalloway Woolf blurs the distinction between direct and indirect speech, freely alternating her mode of narration between omniscient description, indirect interior monologue, and soliloquy. Malcolm Lowry's novel Under the Volcano (1947) resembles Ulysses, "both in its concentration almost entirely within a single day of [Its protagonist] Firmin's life ... and in the range of interior monologues and stream of consciousness employed to represent the minds of [the] characters". Samuel Beckett, a friend of James Joyce, uses interior monologue in novels like Molloy (1951), Malone meurt (1951; Malone Dies) and L'innommable (1953: The Unnamable). and the short story "From an Abandoned Work" (1957). The technique continued to be used into the 1970s in a novel such as Robert Anton Wilson/Robert Shea collaborative Illuminatus! (1975), with regard to which The Fortean Times warns readers, to "[b]e prepared for streams of consciousness in which not only identity but time and space no longer confine the narrative". Scottish writer James Kelman's novels are known for mixing stream of consciousness narrative with Glaswegian vernacular. Examples include The Busconductor Hines, A Disaffection and How Late It Was, How Late. With regard to Salman Rushdie one critic comments, that "[a]ll Rushdie's novels follow an Indian/Islamic storytelling style, a stream-of-consciousness narrative told by a loquacious young Indian man". Other writers who use this narrative device include Sylvia Plath in The Bell Jar (1963) and Irvine Welsh in Trainspotting (1993). Stream of consciousness continues to appear in contemporary literature. Dave Eggers, author of A Heartbreaking Work of Staggering Genius (2000), according to one reviewer, "talks much as he writes – a forceful stream of consciousness, thoughts sprouting in all directions". Novelist John Banville describes Roberto Bolaño's novel Amulet (1999), as written in "a fevered stream of consciousness". The twenty-first century brought further exploration, including Jonathan Safran Foer's Everything is Illuminated (2002) and many of the short stories of American author Brendan Connell. ^ Joanne Winning (2000). The Pilgrimage of Dorothy Richardson. Univ of Wisconsin Press. ISBN 978-0-299-17034-9. ^ In a letter to the bookseller and publisher Sylvia Beach Windows of Modernism: Selected Letters of Dorothy Richardson, ed. Gloria G. Fromm Athens, Georgia, University of Georgia Press, 1995, 282. ^ "interior monologue." Encyclopædia Britannica. Encyclopædia Britannica Online. Encyclopædia Britannica Inc., 2012. Web. 24 Sep. 2012. ^ "The Tell-Tale Heart - story by Poe". ^ "Edgar Allan Poe Society of Baltimore - The Life and Writings of Edgar Allan Poe". www.eapoe.org. ^ "Martin Humpál: Hamsun's modernism - Hamsunsenteret - Hamsunsenteret". hamsunsenteret.no. ^ Woolf (March 2003)A Writer's Diary: Being Extracts from the Diary of Virginia Woolf. Harcourt. pp. 33, 39–40, 58, 86, 215, 301, 351. ^ "stream of consciousness - literature". ^ [untitled review], Beno Weiss, Italica, Vol. 67, No. 3 (Autumn, 1990), p. 395. ^ Giles Harvey, "Minds Are The Strangest Thing". The New Yorker, May 20, 2013. Shaffer, E.S. (1984). Comparative Criticism, Volume 4. Cambridge: Cambridge University Press. p. 119. Retrieved 12 Jan 2011. Tumanov, Vladimir. Mind Reading: Unframed Direct Interior Monologue in European Fiction. Amsterdam: Editions Rodopi, 1997. Googlebooks.